As your business grows, so does your need to do more with less. How do you do that? Automation is the answer. In your day-to-day activities, you may have a lot tasks that need to be completed, but not enough time to carry them out all by yourself. What do you do? Once again, automation is the answer. For example, say you want to send a welcome email any time a lead enters the CRM. Hundreds and thousands of leads may enter the CMR. Sending to each one of them a welcome email manually would be a waste of time and resources. 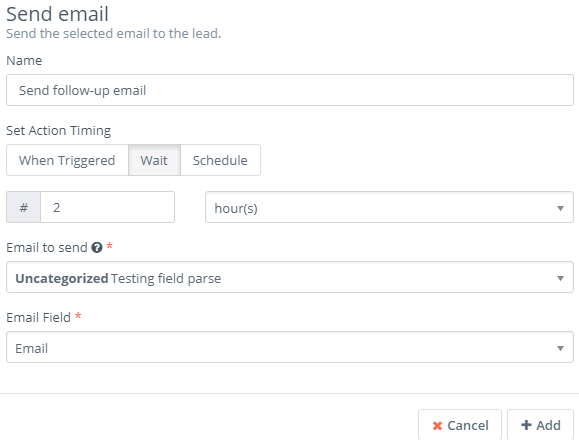 With Flexie, you can build a workflow rule which automates the process of sending welcome emails to leads that enter the CRM. Or say you want to assign every lead that enters the CRM to a specific user within your organization, for example. If you don’t have a tool which automated this process, you would have to manually assign each lead the enters the system to a specific user. That is far from being efficient. In Flexie CRM, you can easily automate this process, thus saving time and resources. Automating repetitive but important tasks is crucial for every company- regardless of size and type of industry. With the concept of automation explained, let’s now illustrate it with a concrete scenario. First, let’s suppose that you want to automatically add points to leads if they open your marketing email. Also, you want to send a follow-up message to the leads that open your marketing email, but you don’t want to that immediately; you want the follow-up email to be sent 2 hours after the marketing email has been opened. First, navigate to Workflow on the main menu. On the drop-down menu, click Manage Workflows. Next, go to the upper-right corner of the screen and click New. Choose the workflow entity type. In our case, the workflow entity type would be Leads. Give the workflow a name and a description. Choose a category(optional) and then click the Launch Workflow Builder button. To build the workflow, you have to choose the source first. Let’s choose Listener as our workflow source. As the name suggests, the Listener “listens” for certain events that might happen within the CRM. You want to add points and send a follow-up email to the leads which open your follow-up email. Go to the Watch For events and select Open Marketing Email. 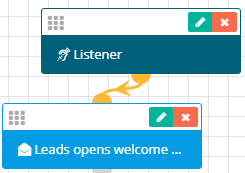 Connect the open marketing email with the Listener. Whenever a lead opens a marketing email, the Listener will ‘notice’. Next, you want to execute actions upon a lead opening your marketing email. Say you want the system to automatically add 5 points to a lead upon opening your marketing email. How do you do that? It’s very simple. Go to Actions and choose the Adjust lead points button. As you can see in the form below, you can increase or decrease points. First, give it a name, choose When Triggered and then go to Points and set 5. You should select When Triggered because you want the lead to be added 5 points once he opens the marketing email. Next, click Add. Connect the Adjust lead points with the Open Marketing Email event. 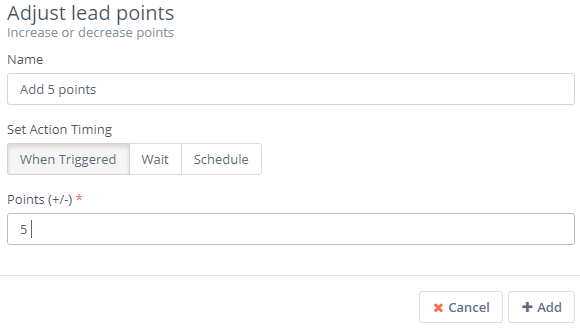 In addition to adding points to the lead, you also want to automatically send a follow-up email, but you want to wait 2 hours. Once gain, go to Actions and select the Send email button. Give it a name and when you go to Set Action Timing, click Wait. Choose the number 2 on the left, and selected hour(s) on the right. Next, choose the email you want to be sent and then select the email field. Double check to avoid mistakes and then click Add. 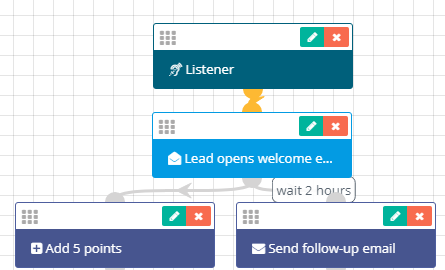 The workflow we’ve just created will automatically add 5 points to the leads and send them a follow-up email any time they open a marketing email. This is just one of the many concrete examples of automating tasks in Flexie CRM. To stay updated with the latest features, news and how-to articles and videos, please join our group on Facebook, Flexie CRM Academy.